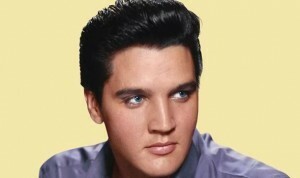 January 8th is the birthday of Elvis Presley. If he had lived, he would be 81. Elvis died in 1977, thirty-eight years ago, but just mention his name, and there is instant recogniton, even from those far too young to remember him clearly. I was never a “fan” of Elvis Presley, but I always enjoyed his music. 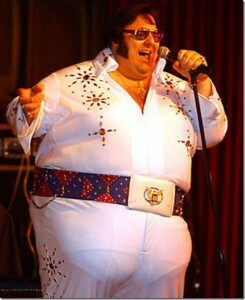 There is no doubt that as a cultural icon, Elvis is indisputably “The King”. After seeing this performance, which I thoroughly enjoyed, I learned that Doug Church is just one of many Elvis tribute artists. Elvis Aaaron Presley was born in 1935 and died in 1977. In a lifespan of just 42 years, he became arguably the most famous singer of all time. 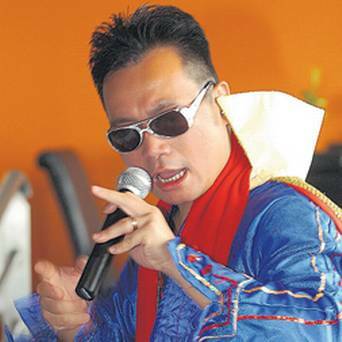 During his career, he recorded between 665 and 711 songs (the actual number is in dispute). He had twenty number one albums, and thirty-six number one singles. He appeared in thirty-two movies. Books and movies have been written about his life. His music was (and is) known around the world. 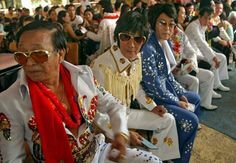 Even though he has been gone for almost four decades, his persona lives on in the form of an army of Elvis impersonators. 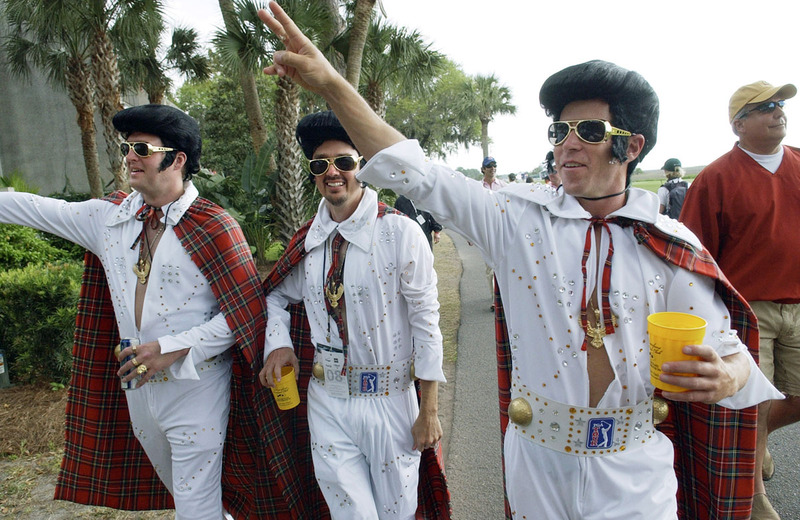 Elvis impersonators come in three forms: The look-alikes; not necessarily perfomers, but available for your next party or supermarket opening. The sound alikes; singers who attempt to imitate Elvis’ voice. 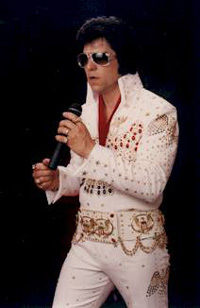 And finally the tribute artists; professional performers who put on Elvis-oriented shows, sometimes traveling around the world to perform. 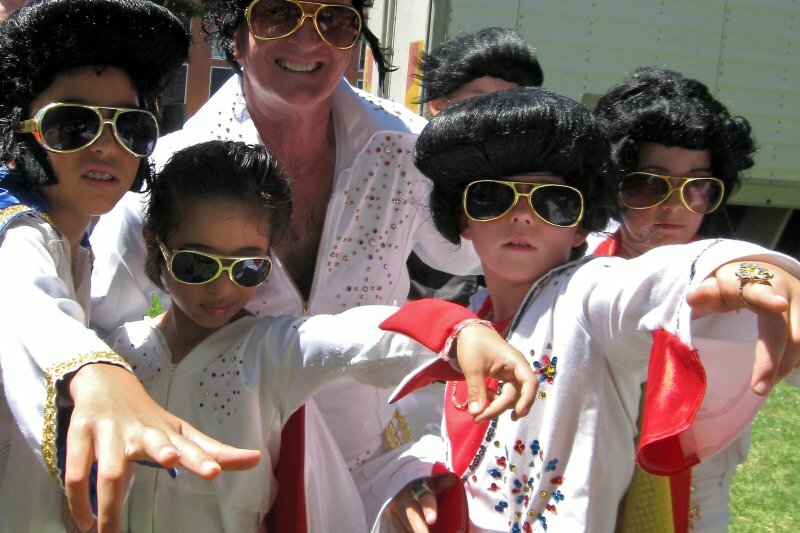 So many Elvis’s, so little time…. 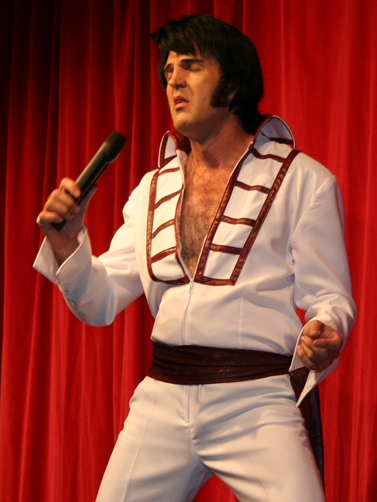 Comedian Andy Kaufman “made his bones” with an Elvis impersonation back in the 70’s. Elvis lives, at least in the minds of those who follow the shows of tribute artists. But a take look at the audiences of these shows, and one sees a lot of gray hair. It would seem that as the audiences age, the popularity of Elvis remembrances might fade as well. 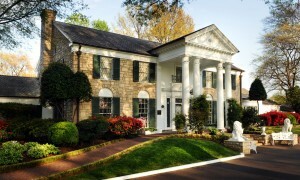 On the other hand, Graceland, Elvis’ home in Memphis, still attracts over a half million visitors a year. Graceland was voted top U.S. iconic tourist attraction by USA Today readers in 2012. 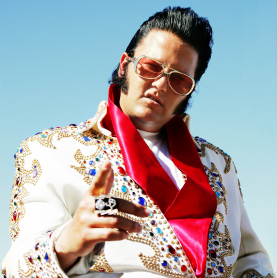 The deceased Elvis earned $55 million dollars in 2012, just behind the top two deceased performers, Elizabeth Taylor and Michael Jackson. An then there is Warner Brothers, who reportedly has secured the rights for the entire Elvis music catalog as part of a planned Elvis biopic under discussion. As far as the tribute artists, there are still a few balcony seets left for the Ultimate Elvis Tribute Artist contest to be held in Cincinnati in January. Cheap seats in the nosebleed section start at $175, and there are not many left. 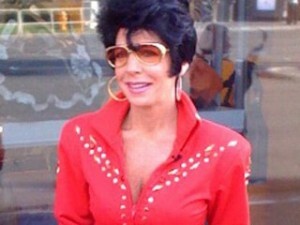 Can you tell me where on the web you got the bad Elvis #3 picture? I’m trying to find it for an ad I’m doing. I work for an ad agency out of New England. 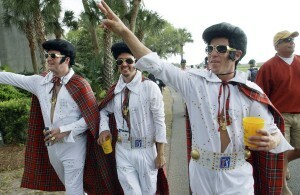 My boss was searching for Elvis impersonator photo. He found this and fell in love with it. Found it in a Google search, I’m sure you can too.